If you have a lot of MP4 files, you may want to convert MP4 files to DivX files. The reason is probably mainly that you wish to play your MP4 files on some DivX certified® hardware devices. If so, you can refer to this helpful guide below on how to convert MP4 to DivX, so you can enjoy your movies or videos at any place you like. Actually, DivX is a video codec rather than a video format. So if you use an ordinary video converter, it'll be very troublesome for you to convert files to DivX because you can't find the DivX format you want in this software. However, if you use a special and powerful DivX video converter like Wondershare UniConverter (originally Wondershare Video Converter Ultimate), things will become very easy. 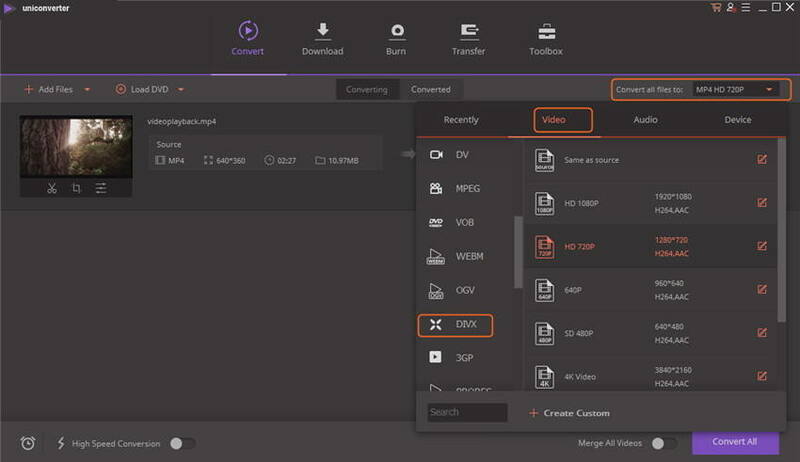 This software directly offers you a DivX option, so you can select it with one click to set the output format. Not only the operation is quite easy, but the output DivX videos still keep the high quality. Now, please read on the guide to know how to convert DivX videos to other formats and vice versa. Directly convert MP4/AVI/MKV/MOV and 1,000+ other formats to DivX videos. Convert MP4 files to DivX in batch with 30X faster conversion speed compared with common converters. Burn videos to DVD with free menu templates and play with your DVD player. Additional toolbox with functions of Fix Media Metadata, VR Converter, GIF Maker, Screen Recorder, etc. Step 1 Import MP4 files to Wondershare DivX video converter. First of all, you need to run this program, and then you can import your MP4 videos into its Convert window. To import your local videos, you either simply click the Add Files button on the top-left corner of the window, or directly drag and drop your target files from the computer to this program. Step 2 Choose DivX as the output format. Now, you need to choose DivX as the output format. You either click the format image on the right side of the interface or hit the drop-down list on the Convert all files to panel to do this. After you enter into the output format window, you need to go to the Video category to find divx format. In the last step, you just need to click the Convert button located in the middle of the interface. Then, this great MP4 to DivX converter will perform the video conversion with ultra-fast speed and in high quality. 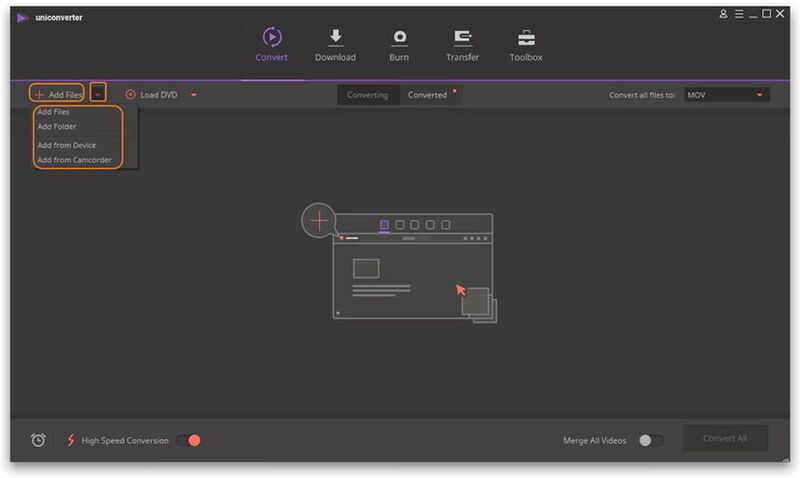 You'll see the purple bars which represent video conversion progress, so you can clearly know how long the conversion will last. Note: You'll find the converted files will be AVI files encoded with DivX, since DivX is actually a video codec. Please rest assured that the output files are absolutely your desirable ones.